Find out what our customers are saying about FotoForms and the products they produce. Fotoforms is a small company founded in 1986 as Fun Shots. Fun Shots was the first company offering laser-cut family Photo Cutouts and Photo Pop Outs through film processors throughout the United States. By 1993 our company evolved; Many non film customers began to see the potential of our processes to create unique products for Corporate/point of purchase display, Museum Exhibits, Trophies, events and team building and puzzles among other things. 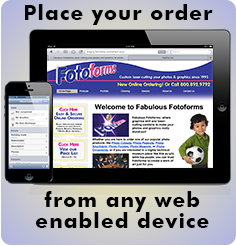 In 1993 we changed the name to Fabulous Fotoforms, Inc to better reflect all the forms your graphics could take. 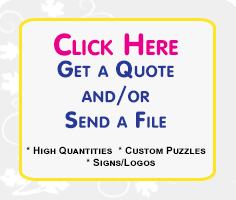 We specialize in combining graphics capabilities with industrial laser-cutting to produce dynamic cut-to-shape images. We’re artists: Over half our staff has some type of art degree, these people do graphics work and program the laser to beautifully cut your specific photo or project. We’re technical: The owner has a degree in Physics, managing and fine-tuning the laser for precision and conceptualizing procedures to create the products you want. Every scrap of waste acrylic is sent to a recycling company to be remade into recycled acrylic. We pack our products in environmentally friendly peanuts made from corn starch. If you get packing materials other than corn starch peanuts it is because we are reusing packing materials sent to us by our suppliers. We’re a USA manufacturing business and choose to use American made acrylic and other American made components in our products. We’re creative: We love new and exciting projects suggested by our customers. Sometimes it takes some time to figure out how to make your ideas a reality, but we relish the challenge. If you envision something that’s not found on our website, but that involves graphic and/or laser-cutting please check with us anyway. Most importantly, we’re small enough to really appreciate your business. Our goal is to provide a high quality product at a reasonable cost so that we earn your business now and in the future.